The Cumberland & Dumfriesshire Farmers Mart P.L.C. had forward 40 prime cattle, 0 young bulls, 10 over thirty month cattle, 5,381 prime lambs and 6,528 cast ewes & rams at their weekly sale at Longtown on Thursday 7th October, 2010. A smaller show of prime cattle saw butchers heifers a brisk trade once again. Top price of 178.5p for a Limousin heifer from J. & N. Blaylock & Son, Hallburn to J.A. Jewitt Butchers, others 172.5p Toppin Castle and Hallburn; Charolais 156.5p Hallburn; Angus 152.5p Townfoot. Bullocks to 149.5p for a Limousin from Townfoot; Blonde d’Aquitaine 145.5p The Challenge; Luing 138.5p Townfoot; Saler 133.5p The Challenge. OTM cows sold to 127.5p for Limousin for Blindhillbush, 119.5p The Keep; Simmental 94.5p Trough Head; Angus 87.5p Kildaloig; British Blue 86.5p Killeonan; Blue Grey 77.5p Sorbietrees. The 5,381 prime lambs were presented to the usual ring of buyers. Many lambs 44-48 kilos were forward and harder to cash but export weights lambs were sharper. Overall average of 151.5p. Top price per kilo of 180p for Charollais’ from Millaires and to £82.50 per head for Beltex’s from Kilncroft, others £79.80 Gallowberry; Texel £81.50 Golden Lane, £76.80 Sharplaw; Suffolk £79.50 Sceughdyke, £74.80 Boreland; Greyface £75.20 Beech House, £68.80 D’Mainholm; Charollais £71.50 Low Stokoe, £70.50 Mossband; Lonk £66.20, £59.80 Bush of Ewes; Half Bred £66.20 High Moat, £61.80 Dodgsonstown; Blackface £65.20 Peela Hill, £62.80 Allensgreen; Zwartbles £65 Holmlea; Cheviot Mule £64.80 Tarrasfoot, £59.80 Terrona; Oxford £63.50 Guards; Leicester £62.50 East Unthank; Hill Cheviot £59.80 Damhead, £59.20 Murtholm; Herdwick £49.80 Laalsteins. The 1,017 lightweight lambs sold to £62.80 for Texels from Golden Lane, others £57.20 Edges Green; Zwartbles £60.50 Cubby Hill; Suffolk £59.20 Commonside, £53.80 Newington; Charollais £58.50 Haggistone Holm; Blackface £56.20 East Fortissat, £52.80 Riskinhope and The Heugh; Cheviot £54.80 Killean and Mainside; Greyface £54.20 Blacksmiths, £53.20 Newington; Swaledale £51.50 High Burnfoot; Easycare £50.20 East Fortissat; Herdwick £41.80 Sundhope. Another massive show of 6,528 ewes and rams were forward to a full ring of buyers. Heavy ewes were slightly easier on the week but well fleshed Blackface, Swaledale and Cheviot ewes were sharper. 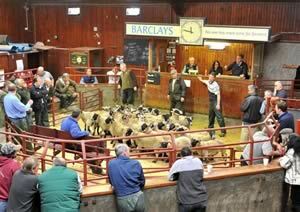 The sale was topped at £205 for Suffolk rams from Gateside, others £143.50 Catslackburn; Texel £133.50 Borthwick Brae, £113.50 Roadside; Beltex £104.50 Stackbraes; Lleyn £103.50 Golden Lane; Leicester £103.50 East Cragside; Hill Cheviot £92.50 Mainside, £88.50 Torrisdale; Charollais £90.50 Brantwood; Ryeland £88.50 Dunnabie; Blackface £76.50 Pirntaton, £68.50 Golden Lane; North Country Cheviot £73.50 Queenshaugh; Swaledale £70.50 Sanders Close, £59.50 Sheepriggs. Heavy ewes to £110.50 for Charollais’ from Roadside; Texel £108.50 Severs and Winterhope, £106.50 Severs and Church Road; Suffolk £102.50 Severs, £100 Middle Shipley, £98.50 Roadside; North Country Cheviot £90.50 Sockbridge, £89.50 Bardnaclaven, £86.50 High Moat; Leicester £88.50 Blacksmiths, £86.50 Knarr Farm; Beltex £84.50 Butterdales, £82.50 Sockbridge; Lleyn £83.50 Whitcastles, £66.50 Gatehouse Cote; Greyface £77.50 Slealands, £74.50 High Glen Triplock, Mossburnford and Langraw, £73.50 Knowe Farm; Half Bred £76.50 Burnfoot on Esk; Cheviot Mule £72.50 Nirvana, £70.50 North House, £68.50 North House; Zwartbles £64.50 Cubby Hill; Milk Sheep £52.50 Millaires. Hill ewes to £80.50 for Cheviots from Auchenhill, £68.50 Alton, £67.50 Sorbietrees and Butterdales; Blackface £64.50 Whiteside, £63.50 Oakshawhill, £62.50 Fruid and Whiteside; Swaledale £62.50 Sanders Close, £60.50 Brantwood, £53.50 The Ash; Lonk £59.50 Bush of Ewes; Herdwick £46.50 Common House, £43.50 Brantwood.